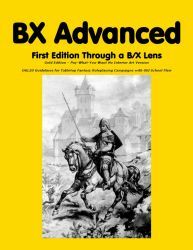 The Pay-What-You-Want (aka Free) no-art version the Gold Edition of BX Advanced: First Edition Through a B/X Lens is finally available! The BX Advanced Gold Edition is designed for people who want a classic experience without a lot of the gonzo material that many people added to their 1980s games. The Gold Edition is pretty much classic 1e using the B/X rules system. The BX Advanced Gold Edition includes a number of optional rules systems, but they are fairly tame in what they do to the game. The Gold Edition includes a sample dungeon and a complete small campaign setting. The upcoming BX Advanced Adamantine Edition will take the game into new realms with optional systems for things like technology and mutations, many additional classes, spells, monsters, and treasure, and much more. RetroRoleplaying Cancer Fund donors can download a password protected zip file with a copy of the paid “with art” version at the usual “donor download” place with the usual donor password. Looks like B/X Advanced is doing really well over at RPGNOW. It's been the #1 bestselling title for a while now. Congratulations!